There’s so much to do at Disney Parks and Resort Hotels for the Easter Holiday; scavenger hunt in the park, Easter brunches and fancy dressed characters. We have a the whole lowdown for you to answer your Easter at Disney related questions. Are Disney Parks open on Easter? Spring is a great time to visit the happiest place on earth and celebrating Easter at Walt Disney World can be a fun experience for the whole family! There are many things to see and places to go, as well as special activities that only happen this time of the year. Hop on down below to our list of Disney Must-Do’s for Easter break! 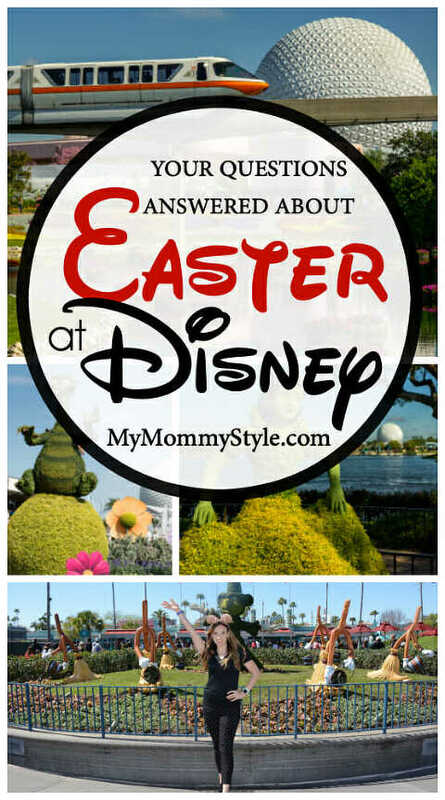 What is there to do at Epcot for Easter? 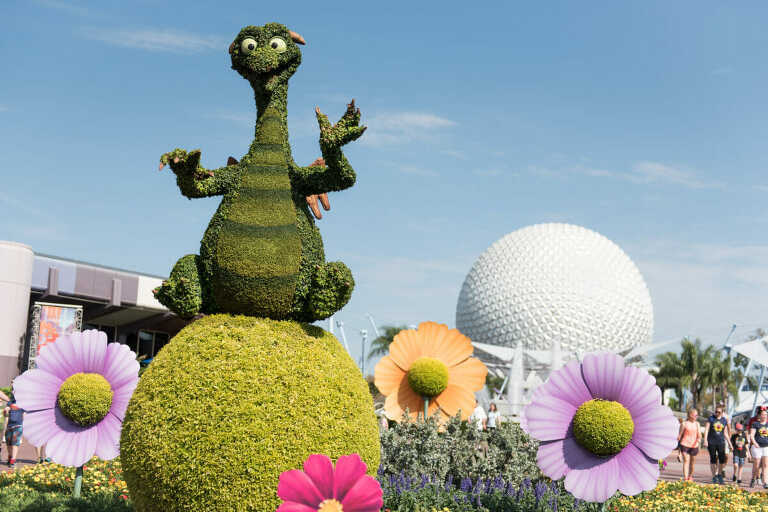 Get into the spring mood by visiting Epcot’s International Flower and Garden Festival (which runs March 2 to June 3 in 2019). 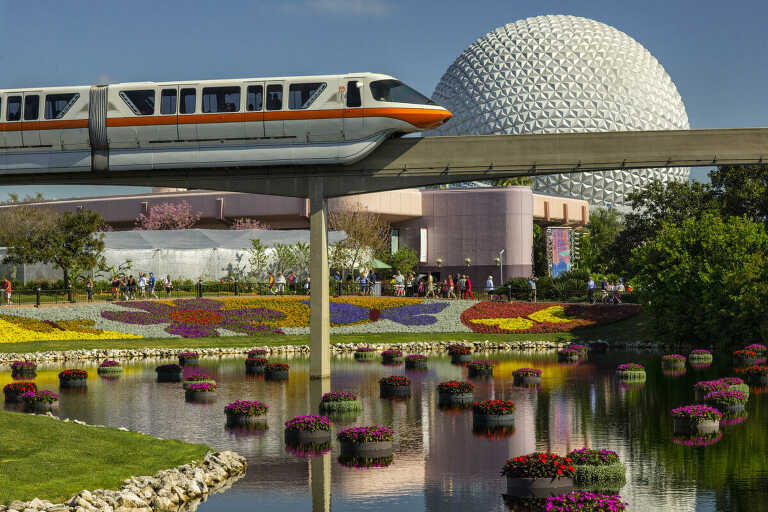 You’ll be able to taste seasonal dishes at kiosks around the World Showcase, get to view special musical guests in concert for the Garden Rocks show series, and view the most amazing topiaries modeled after your favorite Disney characters! One of Hakuna Moscato Mom’s favorite Easter activities is the Eggstravaganza. For a limited time, April 5-21, you can play along in this park-wide Easter Egg hunt for just $6.99. Simply pay and pick up your map at the Port of Entry and begin hunting down your favorite Disney characters hidden as eggs. When you spot one, you’ll place a matching sticker to mark the right character in the corresponding spot on the map. Once you’re done, head over to Disney Traders to return your map and claim your prize! Us moms love that even if your little one decides not to finish, or if any stickers are incorrect, the kind cast members will still reward your efforts- so check it out! Can I meet the Easter Bunny at Disney? At the Magic Kingdom, you can meet Mr. and Mrs. Easter Bunny at Bunny Lane Garden located to the left after park entrance. Get your picture taken with them thanks to Disney Photo Pass cast members helping out on the scene to get the perfect shot! You’ll also be able to see these limited-time characters before the Festival of Fantasy parade begins at 3:00pm. Get a seat on Main Street USA well before the parade starts. If you’re there early enough, you’ll get to hop along with them before the festivities begin. Get ready to see other Disney characters in their Sunday Best along with the Bunnies! What is there to do at the Disney Resorts? Check out the elaborate and finely decorated larger-than-life chocolate Easter Eggs exhibited at the Grand Floridian, Animal Kingdom Lodge, Beach Club and Contemporary resorts. You won’t believe your eyes when you see these true masterpieces on display. Each egg is sculpted, hand painted and designed to display your favorite Disney movie scenes and characters. Most Disney resorts will have characters dressed in their Sunday Best out to greet guests Easter morning. Some resorts (moderate and deluxe) may also offer kids activities like Easter egg hunts and scramble. Check with your front desk or the Resort Recreation Guide for more information and times. Can I attend mass at any of the Disney Resorts? Guests wishing to attend Easter Sunday mass can do so at the Contemporary Resort Fantasia Ballroom on Easter morning. A Catholic mass is held at 8:30am and 10:00am, and a Protestant mass is held at 9:15am. We suggest using Disney transportation (busses, boats, and monorail – depending on where you’re staying) to avoid issues with parking at the resort since restrictions will apply for the holiday. Where can I have Easter Brunch at Disney? An array of Easter brunch offerings will be available on property in Disney Springs and at select Disney resorts. You can call (407) WDW-DINE or visit DisneyWorld.com/dine to make reservations for your family. How busy is Easter at Disney? If you opt out of a formal Easter brunch, head to the parks nice and early! Holidays at Walt Disney World draw big crowds and it is not uncommon for parks to reach capacity. Once parks reach capacity, some guests may be turned away and declined park admittance. All throughout the parks and resorts you’ll find seasonal festive desserts special for the Easter celebration so keep a lookout for these sweet treats! You’ll find premade baskets in Disney Springs, and tons of shopping to put together your own basket for your cute little bunnies to find when they wake up Easter morning! So, there you have it – the run down on the “hoppiest” celebration of the year to make your Easter celebration a memorable and fun event for your Disney-loving family! If you are heading to one of the Disney parks, you need to check out some of other Disney themed posts. 13 TIPS FOR ENJOYING A TRIP TO DISNEY WORLD WITH A PRESCHOOLER! Hakuna Moscato Moms is made up of two Disney-loving moms raising Disney families with frequent trips to Walt Disney World Resort. Check out our Problem-Free Philosophies for traveling with littles at HakunaMoscatoMoms.com and follow us on Instagram @HakunaMoscatoMoms for regular updates on park offerings!